I’m Peanut and I heard that my brother Reeses got a headline last post, so I told mother to get me in there. Here I am “stalking” some of those pesky leaves that keep falling on to my domain! LOL I’ll get them all! Well, the weather has been rainy, chilly and dreary this week, but I wanted to share some of the things I did in the Family Room today. 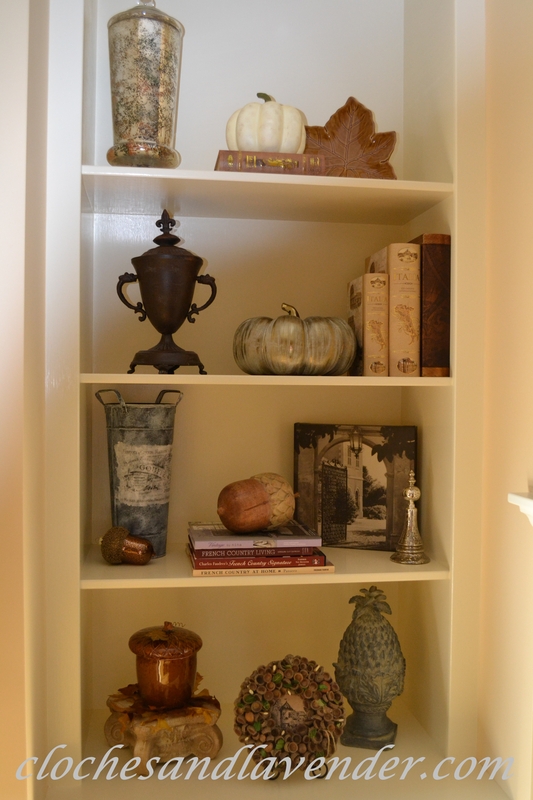 Decorating the great room for fall was so much fun. I really enjoyed making the bookcase somewhat simple. 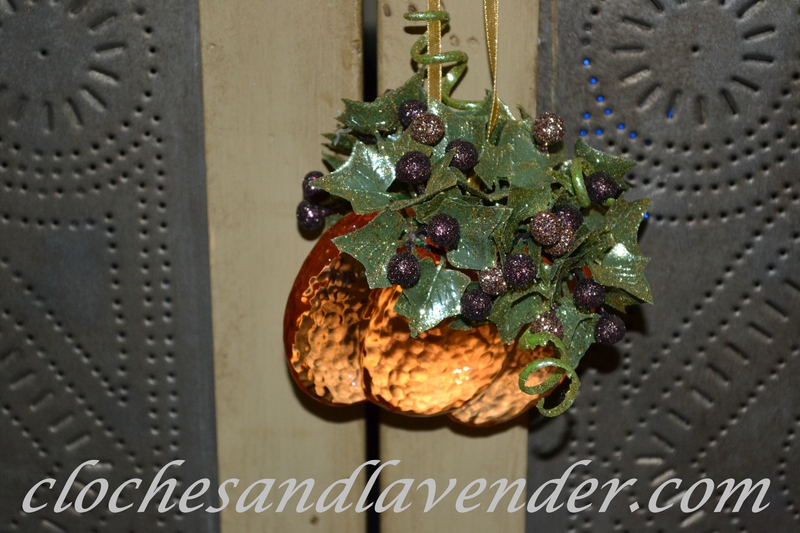 Using pumpkins along with some acorns I have gave me the feel I was looking for. 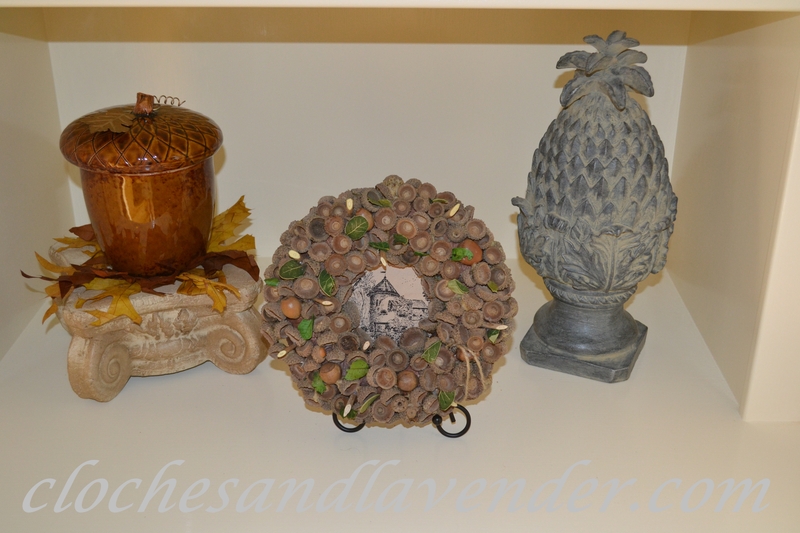 The small acorn wreath is from Décor Steals and I placed it on a small easel. I didn’t care for the easel showing through the wreath. John suggested putting fabric behind the piece. I have to give credit where credit is due. I chose this toile that I had on hand, I love how it looks. I have so many plans for the bookcase for Christmas!!! Now that will really be picture overload, LOL! I left the mantle simple since I didn’t want to fight with the TV and I really like the simplicity. My terrarium, is filled with leaves, pumpkins and pieces of transferware and a small cachet pot. 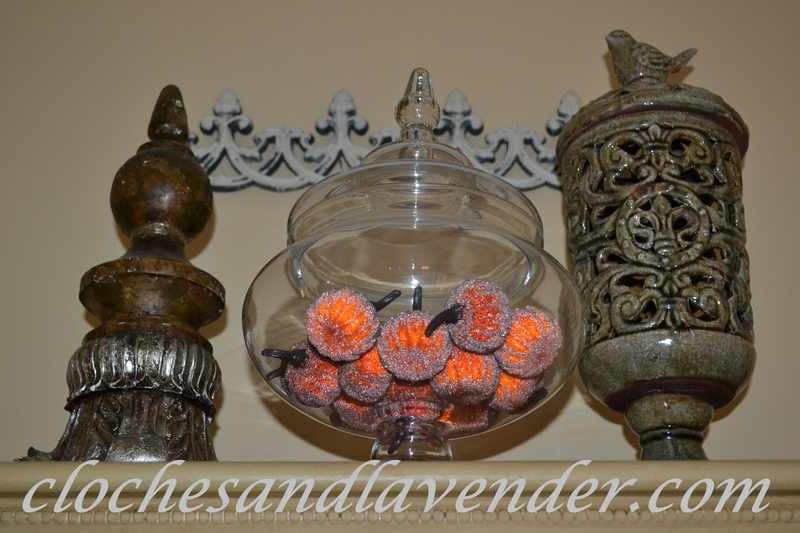 To finish this off, I added some real mums to my Mercury glass jars. Don’t know how long they will last indoors. I have to take them out when watering so I don’t damage the jars. As you can see, this hasn’t been painted yet but will be, I HOPE, before the holidays. 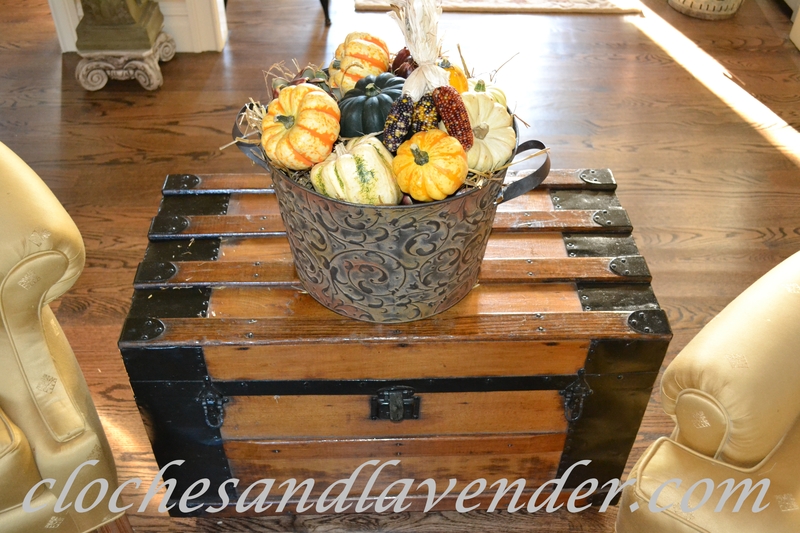 On our antique theater trunk, I filled this metal basket with hay and a bunch of pumpkins and gourds from the garden center. Love the warmth this gives to this area. 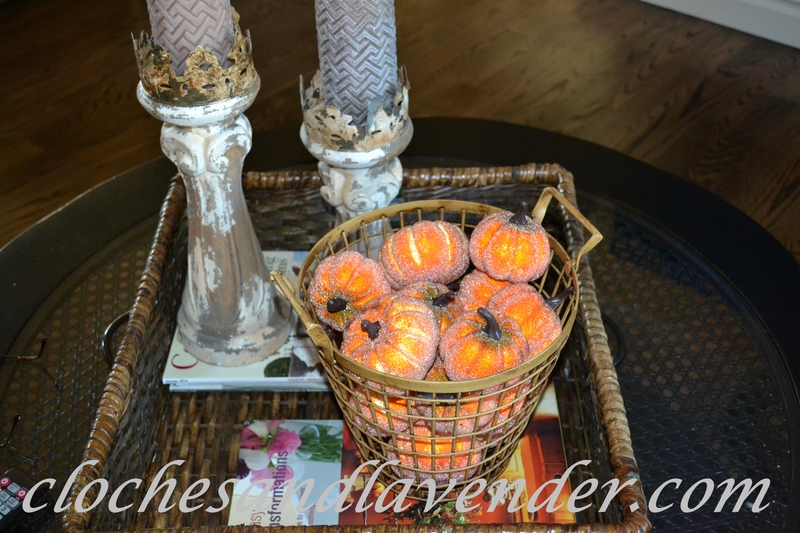 Lastly, there are beaded pumpkins in this wire basket that I purchased a few years ago from HG on our coffee table. Like that metal basket on your trunk! 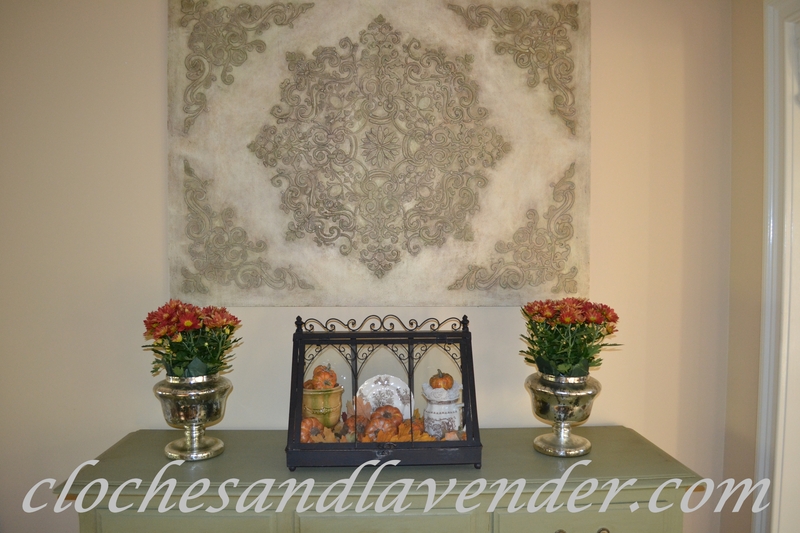 Hi Cindy, Your fall decor is gorgeous and so inspiring. 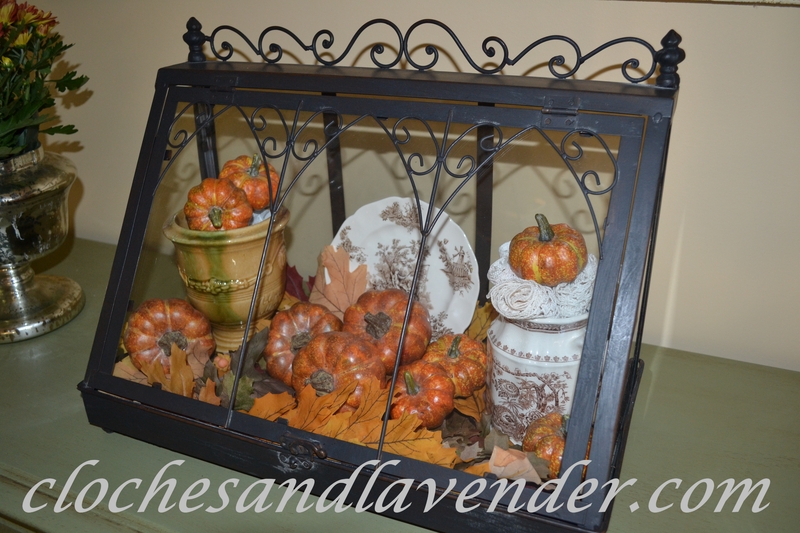 Love the terrarium filled with the pumpkins and transferware. Gorgeous!! Your bookcases look stunning. Love your sweet little Peanut in the leaves. Peanut sure is cute! I love your dogs names. 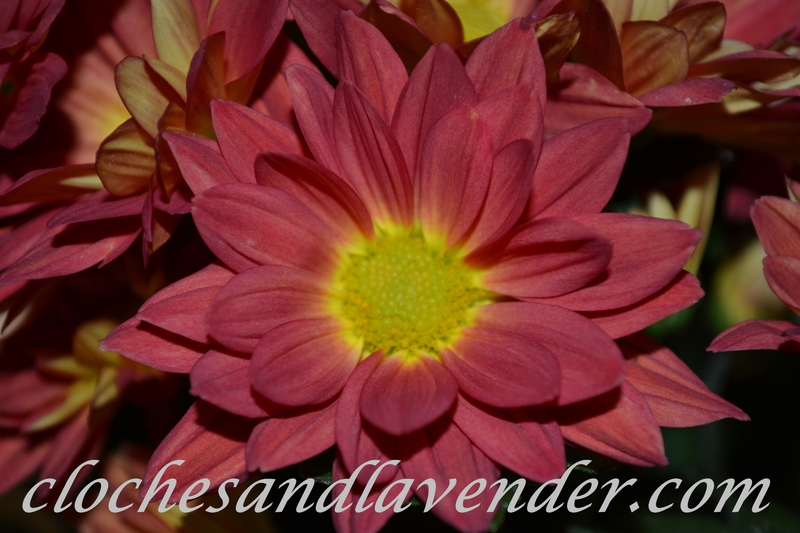 Your Fall décor is very pretty. I know you must be enjoying each season in your new home this year! I am enjoying it and I am planning so many different things for Christmas that I never did before. Honestly, I think it is because it is a smaller cozier home. Hi Peanut! You sure are cute, and I’m glad your Mommy gave you top billing today because you deserve it! Tell her I think it would be a great idea for you to write a post all by yourself! Maybe you and Reese’s could even have your own blog!! How fun would that be?! You’ve already got the perfect names. I can see it now…’Peanut and Reese’s excellent adventures’. Yeah, that’s the ticket. Tell Mommy Aunt Doreen would help you 😉. Such gorgeous decorations Cynthia, and I know what you mean about the mantel. I’m all about simple this year, and that looks just about perfect in my book. Beautiful. I bet you will have fun with all your Christmas decor. Little Peanut is too cute. My grand dog Penny that looks like Reeses and Peanut has her ear turn up like Peanuts all the time. Too funny. Little Penny is staying with us this week end as my daughter is going to a college friends wedding. Little penny loves to bark and chase the leaves too. Cindy, Peanut is too cute! Those leaves are almost as big as her. lol! Your great room looks wonderful. Love all of the acorns! I have a collection also and they are one of my favorite fall things. The wreath is darling, didn’t see that one on décor steals or I would have one too. Hubby has a great eye! My favorite of all is your terrarium display. . .gorgeous! Peanut is such a cutie pie!!!!! 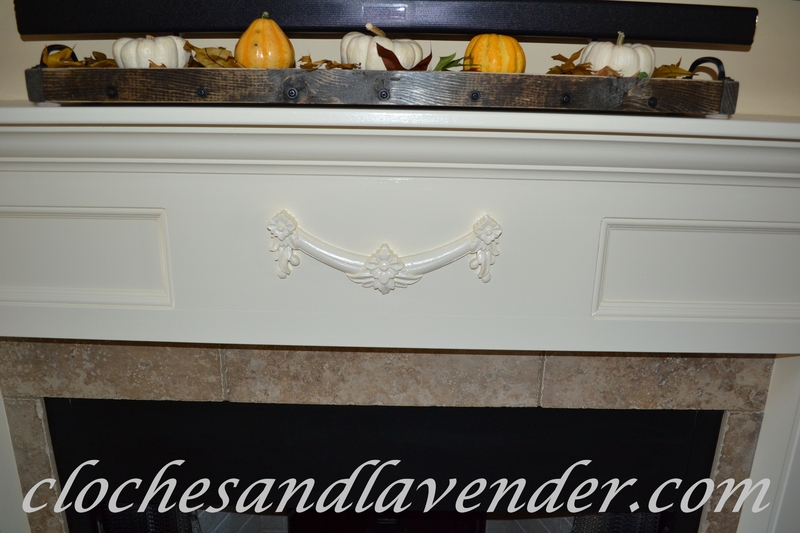 Your fall decor is beautiful too….. Very pretty! Your going to have lots of fun with those bookcases this Christmas!! 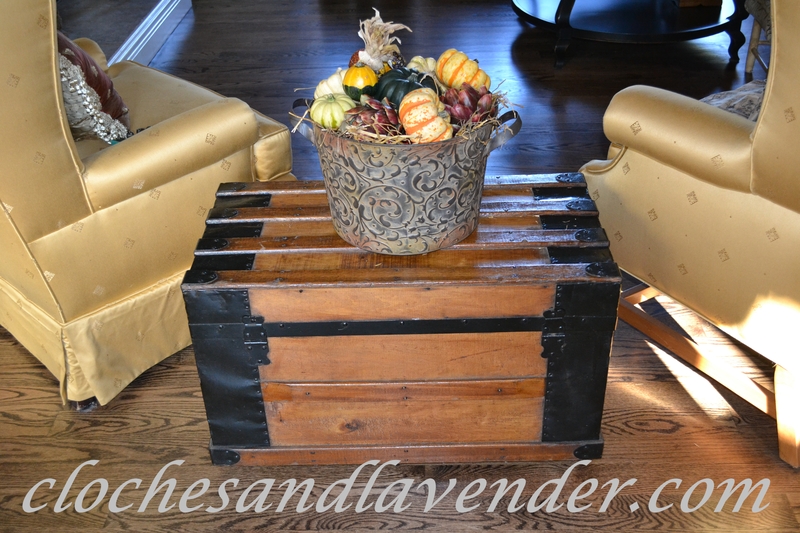 Wow gorgeous…You have soooo much fall decor, there must be no shortage of storage at your new pad lol! I love how you’ve decorated the bookcases as well as the entire room. I know you’re just loving being in your own home and making it so warm and cozy for the season. Very pretty room, Cindy! It looks very warm and inviting. Love that terrarium! Thanks Kathy it’s one of my favorites too. I can’t wait to change it up for Christmas. You have really been a busy young woman around there, and you’re doing a fantastic job of making your new house a real home! It’s got to feel great when you walk in a room to see and feel YOU all over it! Thanks Cathy, I hope you will follow along. Hopping over to visit! Everything looks so pretty. Don’t you just love the glow that fall decor adds to every room? I have a terrarium that I never change up. Think I’ll have to do that after seeing yours. Can’t wait to see what you do at Christmas as this autumn look is so fabulous. 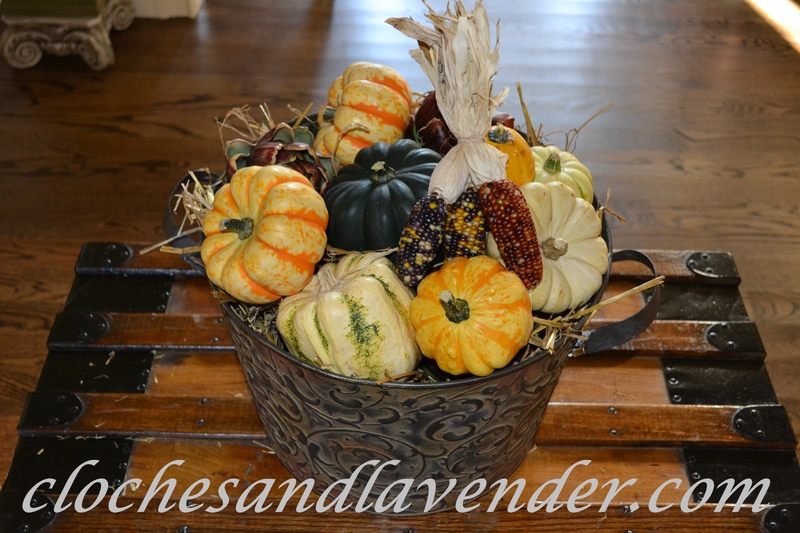 As always, your Fall decor is beautiful …. 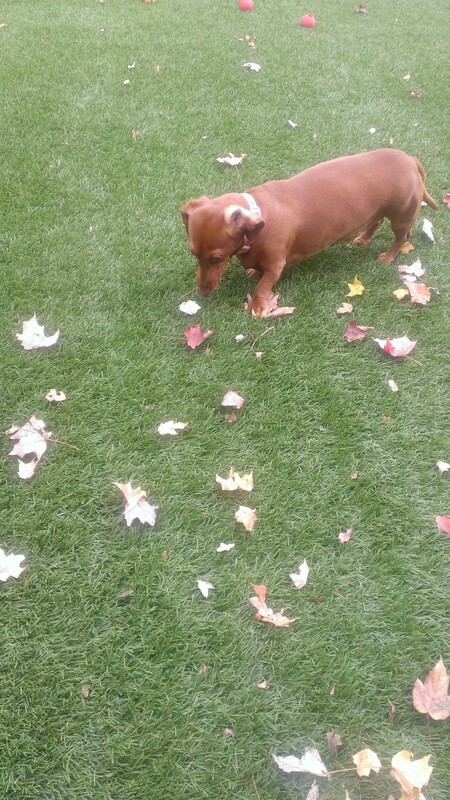 and Peanut looks like he is loving his yard and yes, wondering why those pesky leaves are in his territory!..